Implementing a pull system at the team level is not enough to ensure optimal process efficiency. 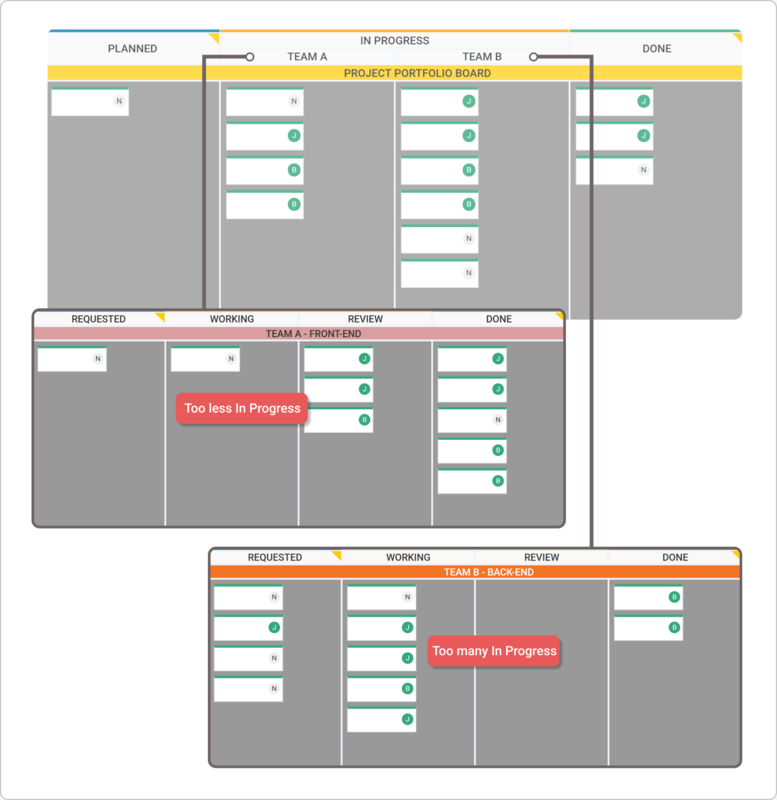 Learn how to take it to the next level with Portfolio Kanban. The concept of pull revolutionized the manufacturing world half a century ago. Since then it has found its way to knowledge-work industries such as software development and marketing. In theory, pull systems are easy to establish and manage. In the next paragraphs, you’ll see the most common problems that get in the way of managers trying to maintain a pull system, and learn how to deal with them by applying the Portfolio Kanban method. In reality, applying pull effectively is easy only on a small scale. When you try to maintain a pull system on a project or even company level, things get tricky. You break down large projects and delegate the different types of assignments among your departments. Your team starts working more efficiently and tasks start moving faster. Everybody starts pulling work and eventually your system becomes a chaos. This is usually caused by a lack of focus due to low visibility and an absence of WIP limits on the portfolio level. 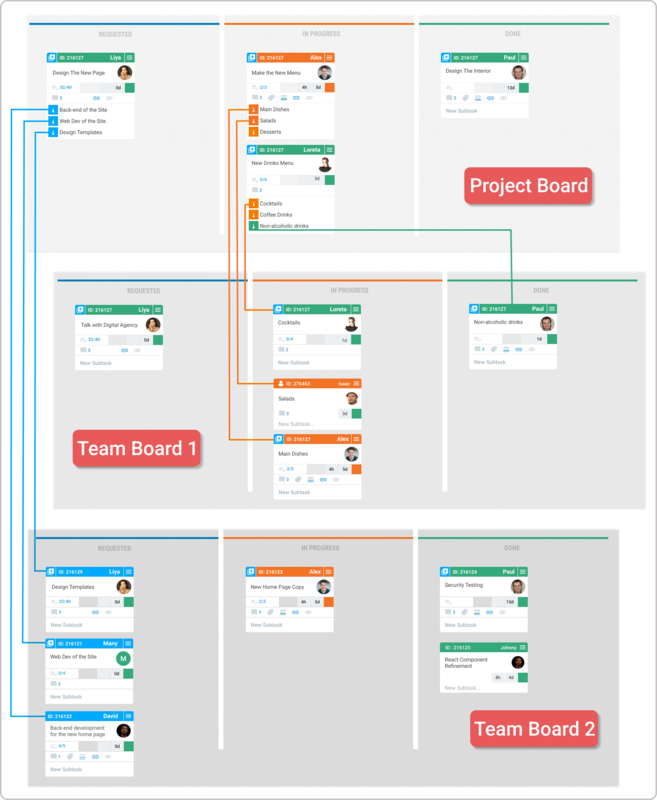 Even if you have mapped your process and are actively applying Kanban, visualizing and limiting your workflow on a global level remains a challenge. Your departments work on their distinctive Kanban boards and pull task after task without seeing the bigger picture or even considering the capacity of their colleagues. As a result, you may face an unpleasant phenomenon – efficient workflows on the team level and inefficient process caused by bottlenecks created by uneven capacity between the teams. Thankfully there is a way to avoid all these problems. It lies in applying the Portfolio Kanban method. It is a lesser-known approach for managing your pull system on a global level by visualizing and putting in order the dependencies in your process. Implementing a pull system at the portfolio level is not that different from the standard application with Kanban. You just need to take the core practices on a global level. When applying pull on the portfolio level, you need to visualize the different layers of work breakdown. With Portfolio Kanban, you can create multiple layers of Kanban boards that host your large initiatives and the small tasks that you break them into. Each level that you create downward, needs to be linked to the larger initiative so it can be explicitly clear how your projects are progressing all the time. The usual card relations in Portfolio Kanban are parent and child. When all children cards are in done, the parent is to be considered done as well. By implementing a pull concept with Portfolio Kanban, you can create an alignment between your departments. Every person will be aware of how the projects are progressing focusing their efforts precisely where it counts. The usual mistake that managers make is applying WIP limits on the team level, but not on the portfolio one. This can result in huge bottlenecks if there is a difference between the capacity of the teams. When implementing a pull system on the portfolio level, it is important to set initiative WIP limits. This can prove to be quite difficult if you can’t see the big picture first and the connections between your teams and their capacity. By applying limits to the work in progress on the portfolio level, you can ensure that work is flowing smoothly. It is better to have a team or two idle from time to time in order to ensure maximum flow efficiency and short cycle times than to keep everybody busy without making significant progress and clogging your process. Maximize the value your teams produce. Limit the work in progress on a global level.